My plan for this edit was to take the Avenger movies and tell them side by side. To tell one organic story. L8, G1, Neg and everyone else who helped with input for this edit. 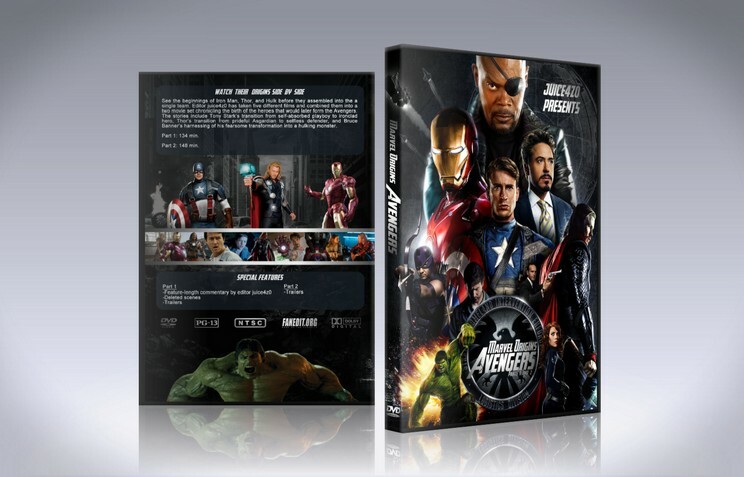 DVD includes commentary, trailer and deleted scenes. My plan for this edit was to take the avenger movies and tell them side by side. To tell one organic story. This however does cause a few issues. The main being that the time of day does not always match. For example The act two fight, it’s Day in Monaco, night in New Mexico and Day in West Virgina. With that being said that’s the only major issue. Agent Collusion has been cut from scenes of Iron Man 2 due to the fact he is New Mexico at the time. So this edit isn’t exactly done chronologically but more told at the same time. 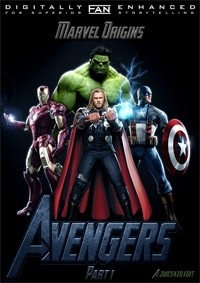 This is a great way to revisit the origin stories of all your favourite avengers while not being completely dedicated to watching around six whole movies, but rather three (avengers included) and it does that pretty well. The edit(s) shouldn't be replacing anybody's original films but it is a good way to watch these films in less time for fun. It showcases the pattern of the films like how action scenes all occur around the same time. The edit cuts between the films at the most stressful times to keep you on the edge of your seat but keeps re-immersing you into different stories a little too frequently, the problem with this concept is that it doesn't give time to develop completely unrelated characters and stories all in one cohesive film. Most of the movies feel like they're there, but I feel less involved in them as I did with the original films. Sometimes the movies very frequently cut back and forth between each other and so much so that it starts to get irritating, especially in the first half of this edit. Great, no obvious cuts, movies cut between each other without any obvious musical change, nicely done. Over all, I still really enjoyed this edit, and will watch part two tonight. Origins is a great way to rewatch Marvel Phase 1. It takes the three modern narratives, Iron Man 2, Incredible Hulk, and Thor, and edits them together. Unlike other cuts, that strive to present events chronologically, Origins is a thematic edit, using the narrative beats of the 3 plots and arranging them so these events cut back and forth to each other. For example, it establishes (briefly) Tony's origin, then moves on to Banner in Brazil, then Thor in Asgard, which sets up all three characters. Then it adds complications in all three stories. Then cuts between sequences of rising action in all three stories. This first part ends in a climax for all three stories. Origins is as much a classroom on narrative technique than it is a great retelling of these stories. I agree with almost all of Juice's editing choices. Most of the scenes removed were of the "stop and look at this cool stuff" variety, which slowed the pace of the original movies down a touch, but which would have made a project like this an hour longer. I especially like the inclusion of cut scenes from IM2, which make Tony out to be even more of a prick, and from Avengers, showing Steve's acclimation to modern life. All in all, a great way to see this epic story again. I had been meaning to rewatch the phase 1 movies, and when I saw this I knew I had to see what all the fuss was about. This review is only about part 1 (I'm writing this before I see the other two parts on purpose) and I really enjoyed this edit. It's been a while since I've seen any of these movies, but I really enjoyed the way you put them all together. In particular the scene transitions were basically flawless (especially the audio editing and soundtrack choices) and didn't feel choppy like some other fanedits. I found the editing to be frustrating in a good way haha. I felt the jumping around in the middle of major scenes built suspense rather than diminished it and at certain points in the movie the coalescence of those scenes made the story even more epic. The one thing that struck me as "missing" was Iron Man building his first suit, but honestly the abridged dream flashback sequence worked well enough without it. We're also given no introduction to whiplash whatsoever, but in the ilk of Game of Thrones (you learn the character's motivations after you see their actions) juice4z0 ended up including the scene with whiplash and tony that explains it all. Only other bit I noticed was a small continuity error where we see Tony on the plane talking with Roadie and Pepper about going to monaco (that flight was supposed to be going to monaco right?) and then shortly after tony is back in LA boxing or something. The last thing I'll say is that considering that Cuba Gooding Jr's Roadie was in the movie for all of 10 seconds, I think with some clever editing you could have just put Don Cheadle in his place in the opening scene (or maybe I'm underestimating how much work that would be). I also realize it's not really your job to fix continuity errors where Marvel's characters get different actors in each movie (though I'm excited to see how/if you handle the Ed Norton->Mark Ruffalo transition). Besides all I said though, this edit reminded me about all the excitement in phase 1 and made me appreciate even more all the new Marvel stuff that's coming out in the next few months. Hello everyone. This review has been a long time coming. I've been waiting to try and figure out how I was going to be able to get hold of this edit. Well, my patience paid off as I was finally able to get a copy of not just this edit, but the complete set of Marvel Origins: Avengers. Here in Part 1, I have to say that it is a fine edit. It serves as a really great primer for Avengers. I enjoyed the fact that each of the stories were subtly brought down to their base components. And love the Iron Man 'origin' sequence. Was I sad to see some things go? No. In fact, this helps the story for each Avenger flow easier and faster. This is a great edit. May serve as a go-to edit for me for the Phase 1 of the Marvel Cinematic Universe. Great job. I'd highly recommend it. 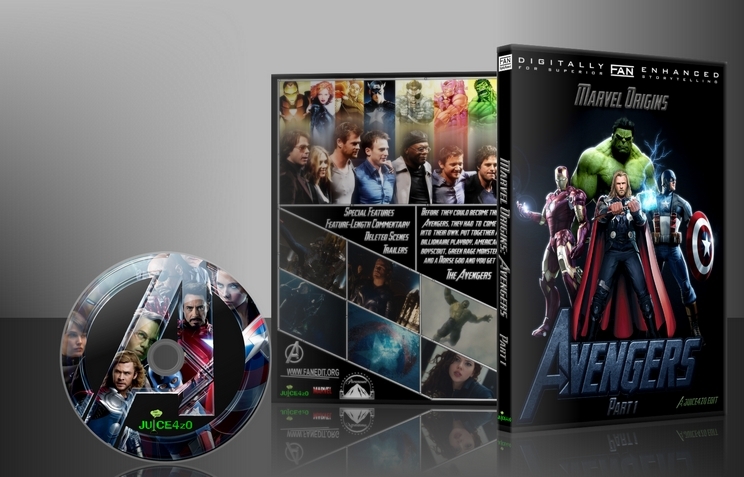 With this edit, Juice draws from FIVE different feature length films, and begins a 3 part epic story that leads to and ends with an edit of the Avengers movie itself. The fact that he has done this with a high degree of technical skill as well as keeps the overall length of this installment to around 2 hours is quite a feat, and is highly commendable! Before I get into the details, I have to say that this kind of edit demonstrates the kind of ambition that is unique to the world of fan editing, and as such, contributes greatly to this art form (the Fan Edit). Juice pushes the boundaries here, and while this edit will not be for everyone, it nonetheless is an edit that shows a large amount of creativity, thought, and originality. I watched the DL DVD version of this edit, and I have to say that for the most part, the A/V quality was on par with the original. That is not to say that the quality was uneven at times; I think merging so many films will necessarily lead to that since each film will not have exactly the same quality level. Also, the inclusion of some deleted scenes contributed to some slight degradation of overall quality. However, that being said, I believe this edit does nothing that compromises the original source's quality, and thus I see no reason to take points away in this category. Removing 466 minutes from 5 movies, yet still making a very cohesive visual story without any overt technical issues is quite a feat! I applaud Juice for his technical skills in accomplishing this, and for the vast majority of the edit the visual editing was seamless. Furthermore, I can say that there were more than one sequence that moved seamlessly from one story to the other at just the right moment; this is true for most of the second act battle, as well as many other times throughout the film. These edits showed a high degree of editing skill, as they truly were invisible in that I felt fully engrossed in the battle(s) as each progressed, and had no problem "switching gears" among them. Again, one of the highlights to me was how expertly Juice timed his edits to keep all the second act battles "in sync" with regards to each individual "battle story arc" -- the prep, the initial action, the low points, and the high points all connected and resonated brilliantly. Additionally, Juice's opening (as well as his new opening credits) were done with true technical and artistic flair. I just have a two small issues regarding the visual editing that ended up being a slight distraction. First, I did find it a bit hard to follow which story we were following at times, due to the almost religious adherence to using straight cuts (I believe there might have been one or two cross-fades, which were well done when used, by the way), which by itself poses no problem, and certainly during the battle scenes this was not a problem. But there were times where we shifted from one storyline to another during the more "expository" parts of the film without the benefit of an establishing shot, and/or a feeling of closure to the storyline we were departing from. Use of audio "j cuts" did help in some instances; again, this was not a huge problem. Finally, as I alluded to already, I think perhaps a slight expansion of editing techniques might have helped the overall pacing and storytelling, as the straight visual cut technique began to slightly wear on me a bit. For example, Juice uses a couple cross fades to strong effect. Maybe some additional cross fades, or fade outs might have helped as well. And while of course one must be very careful with using non-traditional transitions, perhaps there might of been a way to use something not radical yet nonetheless appropriate to a superhero movie to help visually indicate we are switching to a different character's storyline. Again, there was nothing "wrong" with Juice's editing style; I merely mention this as something he might think about for future works. I must emphasize though that in the end, this is a very solid example of skilled technical visual editing! Given the monumental task Juice faced in putting together this edit, I have to first say that the vast majority of audio editing is excellent. There are many examples where disparate scenes (either from the same or different movie) perfectly blend from an audio perspective. I think probably the highlights are the battle scenes, which again, due to the technical editing, are very engrossing and exciting to watch. However, I have to say that there are times when the audio editing does not always achieve the high standard that Juice does reach most of the time. There are moments where hard audio cuts stand out, as well as times when the musical scoring doesn't seem to blend seamlessly enough. Sometimes there are some noticeable audio fades between scenes. Finally, there are some more obvious technical issues with some scenes. The most noticeable to me was the scene from the Hulk, where Bruce is speaking to Betty's new boyfriend; all of the sudden almost all the audio felt like it got transferred to the right channels. When we switched back to another storyline (I think Iron Man's) the audio went back to normal. But this was a bit jarring and it lasted throughout the entire scene, which was not a short one. A smaller but still noticeable one (and has been mentioned in other reviews) is the drifting A/V sync for some of the Iron Man footage. This didn't bother me as much as others, since it was short lived. But it was noticeable nonetheless. Audio editing (in my opinion) is much harder than video editing for fan editors, since we have no access to anything other than the final print, which for audio almost never provides a clean dialog track (among other challenges). Juice did a good job with the audio; perhaps one or two more passes might have helped smooth some of these issues out though. I think this is probably the most challenging aspect of Juice's edit, as well as the hardest to review. Juice explicitly describes his goal to "take the avenger movies and tell them side by side[;] to tell one organic story." With regards to Juice's stated goal, I think this edit succeeds; I did get the feeling that most of the action was occurring simultaneously, and this was due to how Juice approached the edit from a technical perspective. This was well done, though I do think there is more to narrative than this. First, it is explicitly stated as the first part of a series (which we now know to be a trilogy). Thus, the narrative is expected to not have a full closure, but still provide a satisfying mini-ending and link to the next "chapter." Second, being the first part of a trilogy, and having "Origins" as part of the film's title, one might expect that this edit will provide the origin stories for all the superheroes involved. Finally, one might expect that an overarching storyline will exist, as all the source movies each have their own storyline and narrative. My feeling is that Juice succeeds in meeting most of these goals, but not entirely. First, I do want to point out that Juice did a fine job with the origin stories concerning Hulk, Thor, and Loki from a narrative perspective. Yes they were cut down, but Juice manages to provide us all the essential information and does not introduce any plotting problems (except perhaps what Jane is doing when she crashes into Thor…a bit of information for her backstory night have been helpful, but not strictly necessary). Second, I have to point out that Captain America is a complete no-show in this movie, except for the pre-opening credit clip. I think while this clip was cool, it ended up being a completely abandoned thread, and maybe it would have been better to move this clip to Part 2, where I assume we do eventually get to Captain America story-wise. My biggest issue concerns Iron Man. It becomes clear that Juice wants to focus on the events from Iron Man 2, as Iron Man's origin story is only briefly explained via a "dream" sequence that Tony has with a very small amount of footage from the first Iron Man movie. While I respect Juice's artistic choice to forgo telling Iron Man's full origin story, nonetheless I believe it introduces plotting problems. First, it is not exactly clear why Tony is on trial in the beginning, and who the various characters and their motives are during this sequence. Second, it is easy to miss that Tony is the owner of Stark Industries at the time when we do see his brief origin story (which makes the viewing of "Stark Industries" printed on all the weaponry less easy to see why it is important). Third, during the first act action scene, it's not really clear what the significance is regarding Iron Man's activities -- it feels like there is no connection to any narrative other than to show what Iron Man is capable of doing (perhaps that was the sole point). Finally, it is not exactly in line with the narrative framework Juice has established, where all the other Super Heroes get much more time focusing on their origin. Now, these issues can be worked out (or forgiven) by the audience over time as the rest of the narrative unfolds. But the biggest issue (in my opinion) is that Iron Man really loses a lot of depth without some of the narrative provided in the Iron Man movie. We don't get to see Stark's change of heart, and his realization that the weapons he builds are truly not right. Iron Man provides a story that makes Tony Stark a real human being, and I believe that aspect is lost in this edit. Finally, the other big issue concerns the later plot development where Iron Man's nemesis appears late in the movie, and provides the reason why he has appeared -- apparently because of Stark Industries being in the weapons business and the damage caused by that to his home country people. As we never really grasp this concept prior to this, it's a bit off-putting to have such a major plot element revealed so late in the game, so-to-speak. Finally, since we never fully understand the full origin of Iron Man, the meaning and reason for Iron Man's "energy" unit problems feel a bit hard to really understand. Other than that, I only had one other narrative problem worth mentioning. And that was Juice's decision during the second act battle to break up the moment where Hulk saves Betty from the fire, and has a very touching moment with her up in the mountains somewhere. Juice breaks this sequence up by inserting Tony's interrogation of his attacker; from a storytelling standpoint, I felt this hurt the flow of this pretty important Hulk narrative sequence, and wish it had been placed afterwards. Finally, Juice does mention the problem during the second act fight scene where the time of day switches back and forth between day and night. I do have to admit this was distracting, only because Juice had done such a good job in establishing that these events were all happening at the same time. Intellectually we can perhaps assume they are happening in different parts of the world. Perhaps some sort of visual titling overlay might have assisted in establishing this at the start of each "fight sequence" so that we at least were informed of this fact. Not really a huge deal to me though. I've written way more than I probably should have concerning the narrative, so I'll conclude by saying that even though I did have some narrative issues, Juice does provide most of the components I mentioned earlier that meet the goals of narrative with respect to a traditional movie, whether it is about super heroes or not. And I do think the cliff-hanger conclusion was well done, as it had to do with Loki, who will end up being the true villain in the Avengers, and provides us a major plot development (even if untrue) that makes us want to see Part 2 immediately. In the end, it comes down to enjoyment, right? I'm happy to say that I did enjoy this movie, even with the aforementioned issues. I do agree with L8 that ultimately this is a superhero movie, and thus narrative issues take a "back seat" to watching cool battles and seeing super heroes "do their thing." Juice does not short-change us in this area, and there is the added excitement of watching multiple battles (all of which have vital storyline significance) expertly integrated. I'm talking about the "act two" battle sequence, and to me, this is the highlight of the film. Except for the one minor scene ordering issue already mentioned, this sequence is really a stellar example of film editing and narrative pacing at its best! Great work, Juice! Overall, I found this to be an entertaining and enjoyable edit, even if I ended up having some issues. It is hard to compare this with the original movies, as my enjoyment of them varies greatly. Plus, this is just part 1 of a 3 part story. Yet as I said earlier, the true highlight of this movie (the final battle sequence) comes at just the right moment, and is in fact the climactic sequence of the edit. As such, I feel this edit serves as a great start to what promises to be a story that will have a successful, enjoyable, and satisfying conclusion. I can recommend this edit to those who are interested in seeing the backstory of most of the Avengers interwoven together, with the caveats that this is not a complete story, and does not provide the same level of narrative satisfaction that any one single superhero origin story might provide. That said, it has some truly excellent scenes and if you are a fan of these movies, or of superhero movies in general, I think it is definitely worth your time!